In January this year, I took the advise of a girlfriend and signed up to take a motorcycle safety class to see if I liked riding. The first day of class I felt like a kid, getting the gift I had always wanted. 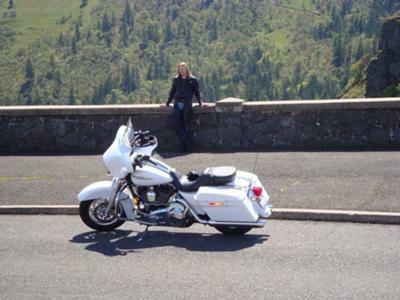 My husband was very cautious when I spoke of buying my first motorcycle at 59! But, as I was doing my search for the right bike, he began to show an interest in my pursuit and before I knew it, he asked me to move over and let's both look. we bought two Sportsters and were riding by February. I was having trouble at highway speeds. The bike felt unstable under me and made me feel very nervous. After about a 1,000 miles of riding, and lots of input from other, more experienced riders, I decided I needed a bigger bike so off to the dealer we went. Well, my husband wasn't going to let me trade my Sportster in without him trading in his! We both found the bikes we loved and felt very stable and safe riding. We just got back from our first three day trip which took us over two states and over varied roads and weather. Now we're planning on taking a month next summer and traveling over much of the west coast. We absolutely love our new motorcycling lives. We never had it so good. Comments for What a Ride It's Been! Gorgeous bike - that's what I want mine to look like once I get done dropping her. lol I have around 7K miles on mine now but its an automatic so now I am going to have to start all over again learning the clutching and coordinate that into riding. I am spoiled with the auto I tell ya. But plan the cream color paint, bags, seat, handlebars, all of it.